Its that time of the year again when ♥ is in the air.All around there are Valentines day combo sales,restaurants have their own special 'love’ buffets and malls across have special contests going on for couples.Its hard to ignore the buzz.But then,why ignore it-when all the world’s celebrating,why not tag along? Last year,we celebrated with a cake and Ajay was pleasantly surprised.This year,however I don’t think the surprise element is there.I bake whenever I feel like and a cake inside the fridge or one in the oven late night doesn’t excite him any more than it did last year.I have not been baking much off late and the reason to bake for Valentines day was enough to shake me off my slumber existence. The cake was very light,surprisingly with all that butter and fluffy.The ganache gave me a bit trouble since it became runny.I whipped it up once and refrigerated it overnight which made the frosting job a bit easier.But if you ask me,I prefer the dark chocolate ganache,with its deep chocolate flavor. Add the flour in 3-4 turns and beat well. Divide the batter into the two pans and bake for 25-30 minutes or until risen,firm and golden brown. Leave to cool in the tin for 10 minutes,then turn out onto a wire rack. For the frosting,melt the chocolate with the milk in a double boiler OR in the microwave. Remove from the heat and stir until smooth then leave to cool. Whip the cream well and fold into the cooled chocolate mixture. Fill and frost the cakes and decorate with sugar flowers and/or silver dragees. Sending this cake to Nina of Confessions of a Bake-a-holic for her Valentine's day Special event!! Looks gorgeous Divya! I love the texture - wish I can have a piece of it now! Cake looks moist and spongy. Lovely frosting. the cake looks soft yum and tempting and i would like to grab it from the picture. The piece looks amazing! Do we get white chocol in India? U ve decorated neatly! Hi Divya! Looks absolutely delicious!! The white flowers look very pretty...are they home made?? I agree and prefer dark chocolate ganache to white as it behaves much better. looks awesome...you decorate cakes so beautifully..i have a long way to go when it comes to decorating cakes..
soooo prettttty and delicious...great job divya...the cake looks really moist.even i like dark chocolate but the white color looks appealing. looks delicious divya!! happy V day in advance!! my gosh...cake looks soo beautiful and perfect.. The cake looks so pretty Divya!! 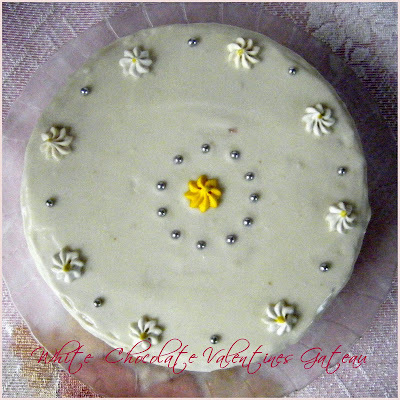 The icing looks so professional :) Wish you both a happy Valentines day!! OMG.. 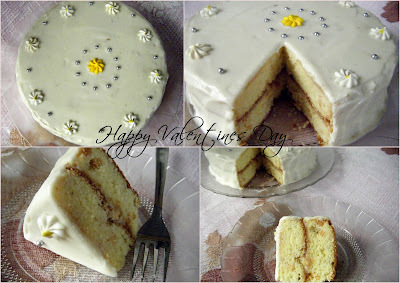 I just dont have the heart to leave you cake post:)!.. its sooo perfect and yummmy!!.. Cake looks too professional, gorgeous and pretty Divya...lovely slices..
Divya.. 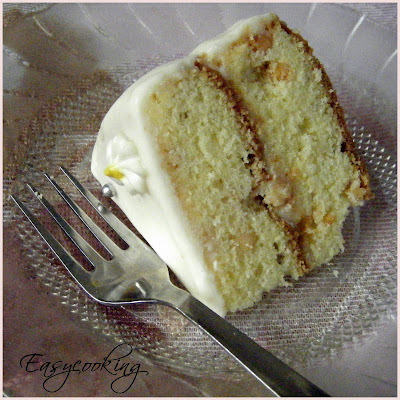 The cake looks very neat and the icing looks so perfect.. neatly done and perfect slice..I will surely try this. BTW I also tried cherry almond cake from Nita mehta's book. I had always wanted to make it seeing in your blog. I wanted to click the snap of it but it was gone before ?I could click a snap. We had some guests over for tea and only few crumbs were left! Where did you pick this book - which branch? Also, where do you get white chocolate chips in chennai? Divu, the cake looks amazing..loved the piped flowers n whiteness of this, plus perfect piece!Can I just dive in for my share? :) Happy Mahashivaratri! Your cake looks gorgeous! It's fluffed so well, just like a sponge cake. Nice creation. Its such a beautiful cake, Divya. Is this one of those little hard bound books from Parragon? Thanks for sharing, However, I tried to make this morning but the cake just simply did not rise at all. I wonder why. I could have missed somewhere around the baking soda thing. But at least my cake is tasty! Planning to do this again. Hopefully, to do it the right way. Hey looks so gorgeous and pretty! Happy V'day! That is such a beautiful cake, Divya-- really exquisite. Divs, I love the lovely look of this beautiful cake :) wish i cud get a pience of it :) i love to bake a lot too, just one thing i worry about is how to recycle the baked item, :) do u donate it ? or do u decide to eat it like one piece a day kinda of thing? or do u send it to friends? u understood what i meant right? I keep oggling at those baked items, and get tempted to do it, but then think how i wud finish it? i am eager to know coz u have so many lovely baked goodies, there must be someway you take care of it right? Hello again Divya... just getting ready to make this cake and I think (not sure :)) that the reason the ganache was runny was because of the quantity of cream... I think its supposed to be a 1:2 ratio.. 1 being cream. Will let you know for sure once the cake is done!! It looks super duper tempting :)! !